Tyler Tree Service has been in business for twenty five years. In that time we have performed countless stump removals and stump grindings for our large clientele of happy customers. Over the years, we have noticed that customers are not always on the same page when it comes to common industry practices regarding stumps and how a tree service will address their removal. For education and to simplify business terms and practices, here are a few things that any customer who aims to get a stump removed from their property should know about. The outright removal of a stump, where the stump and roots are dug up and physically removed from the Earth, is a thorough approach but it can be time consuming and thus expensive. There are instances where a tree has been cleared to make way for a dwelling or other construction project. When an area must be prepared for something like a home foundation, a complete stump removal will be necessary. 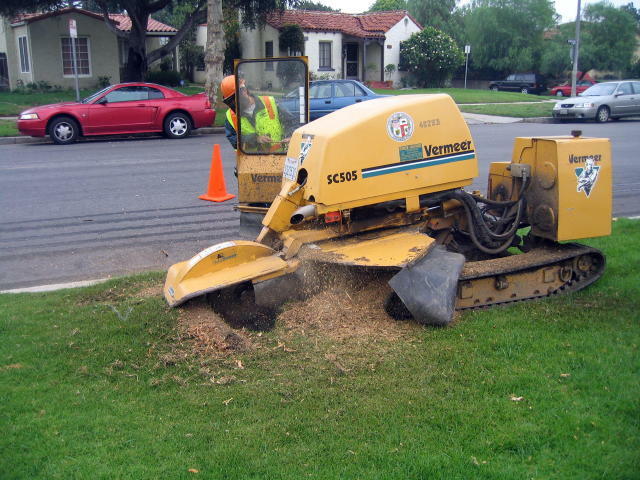 Although stump grinding will leave the root system of a tree intact and at large beneath the ground level, if there are no plans for further development of that area then a complete stump removal is not required. Stump grinding, where the top of a stump is ground down by a large piece of machinery until it is below ground level, is generally much cheaper than a full removal. Grinding a stump can also save money when there are many stumps in an area to clear or when the soil contains many rocks which makes it difficult for digging equipment to penetrate. Some homeowners will attempt to save themselves a lot of money or labor by burning their stumps away or using chemicals to erode away a stump's roots for easy removal. Setting a stump on fire can create a hazardous condition. A sizable stump could take many hours to burn and a lot of people would not be able to monitor a fire for that length of time. Burning a stump also poses the possibility of damaging any conduits or pipelines that are buried nearby. The chemical erosion of a stump can also be hazardous. Homeowners who have not been properly trained to handle the erosion chemicals are prone to accidents. The area where chemicals have been applied must be kept clear of children, pets and other interaction while the chemical process is at work. Care must also be taken that crops or gardens should not be grown near any place where these chemicals have been used. There are many types of wood and they all have different levels of hardness. Harder woods such as oak produce more wear and tear on any machinery used toward their removal. These types of tree stumps often take longer to remove and thus can be more expensive. It's obvious once it has been pointed out, but many customers don't consider how much a root system can effect a stump removal job. Some trees have very basic root systems with only a few main sections. These take less time to remove. Other trees have very complicated root systems with many large roots to cut. These take much more time to dig up and remove, so they are usually more expensive. Perhaps a better way to refer to the removal of a stump from the Earth would be to call it a stump extraction. Once a stump has been pulled out of the ground, a tree service is not going to haul the stump away in every case. Some customers will retain the stump to be used for firewood or other purposes. Although removal of the stump from the property is often thrown into the original job quote as part of a complete package, some tree services will handle the removal and hauling away of a stump as two separate entities. Speak with a representative of Tyler Tree Service today to get a free estimate on any stump removal at your home or business.